Ultrasound technician schools in Tennessee will be the way for interested individuals to pursue sonography careers. With the help of the training institutes such as universities, community colleges and qualified ultrasound tech schools, many interested individuals become ultrasound technicians to help medical doctors diagnose their patient’s medical condition. Here are five ultrasound sonography schools in Tennessee where high school graduates and young professionals can accomplish the different requirements to be qualified to be professional in the field of medical sonography. 1. Baptist Memorial College of Health Science offers CAAHEP accredited programs, which follow the same implementations with the ultrasound schools in Georgia, North Carolina and all other states all over the US. This private school provides ultrasound degree programs in certificate, associate’s degree and bachelor degree programs. If you need to know more about types of programs, see the article on types of ultrasound technician programs. 2. Chattanooga State Community College is located in Chattanooga is offering accredited sonography programs in certificate programs, which can be finished in less than a year or equivalent to one year, and degree programs in associate degree level. This school provides affordable and accessible education and training because this is a public school. 3. Methodist Le Bonheur Healthcare in Memphis offers certificate programs in diagnostic medical sonography. This certificate program is concentrated in General Sonography. 4. Vanderbilt University Medical Center is another ultrasound technician schools in Tennessee providing CAAHEP accredited education. This school follows the implemented guideline of all CAAHEP accredited schools in the US. This school is dedicated to offer diagnostic medical sonography in Certificate Programs, which is concentrated in General Sonography. 5. 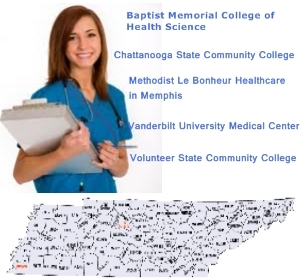 Volunteer State Community College is located in Gallatin and is dedicated to offer Certificate Programs in Diagnostic Medical Sonography. The ultrasound degree program is concentrated in General Sonography. Today, ultrasound technician salary in Tennessee follows the national trend of diversity when it comes to the average salaries in specific areas or regions. It is proven that ultrasound technicians earn more than many other professionals in the healthcare field. The high income is one of the reasons why a large part of the youth population is aiming to become employed as sonographers.